Last weekend another birthday rolled around and spontaneity paid off. My husband and son took me to lunch. At the last minute we decided to see if our favorite Indian restaurant was open. 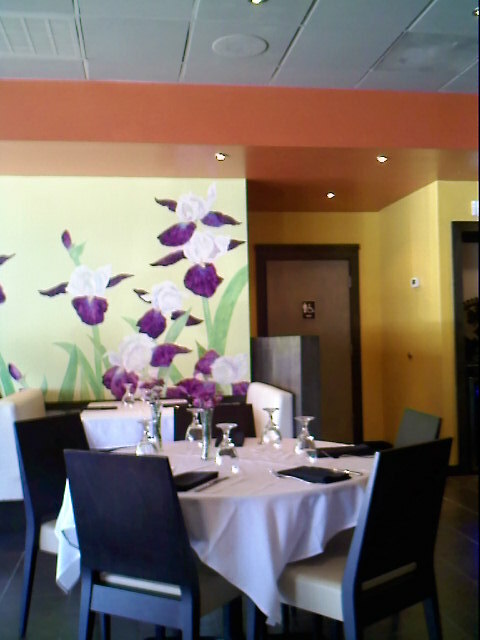 Several months ago, the Nawab closed for renovations following a fire. When we walked into the dining area, what a surprise to find one wall painted with my favorite flowers, irises! Not only was the buffet delicious but mango pudding was for dessert! In Flower Newhouse's book, The Meaning and Value of the Sacraments, I read a passage on the celebration of birthdays. How they aren't just a physical milestone, but a time to reflect on our life and its purpose. She recommends a clean notebook for birthday notes. During the year this journal will be a source to read and meditate upon daily. You can fill it with inspirational and instructive material that you gather along the way. You can record your experiences, tests you've passed and ideals you achieved. 1. In what ways have we achieved inner changes and transformation through the years? If we haven't improved very much, why not? 2. By what means have we been stimulated and deepened in our character? 3. Just how fully are we expressing our spiritual intentions? 4. In what vital ways have we tried to make this world a better place? 5. How much have we advanced in learning to love all life (mankind, the creatures, and nature)? 6. How well are we uprooting negativity? 7. What are our goals for this new natal year? 8. What will be your symbol for this year's ideal? I took Flower's advice and bought a new journal for my birthday notes. I must admit that by focusing on the spiritual aspect of my birthday, the day was richer in every way.